— discover the harmony of nature and technology in a long lasting hair colour system that actually conditions relaxed or natural hair as it colours. This terrific formula of hair colour from Creme of Nature delivers vibrant, long lasting colour and all the conditioning you would expect from Creme of Nature. The breakthrough liquid crystal technology penetrates to the interior of each strand of hair, maintaining a uniform shade from root to end. 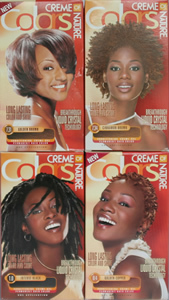 Even locked or braided hair colours uniformly with Creme of Nature Colours. The wheat extract and marine collagen conditioners penetrate to rescue damaged areas and leave behind extra shine.